Despite watching the biggest win of his career evaporate like a fart in the wind at UFC 117, middleweight top contender Chael Sonnen was in good spirits while appearing as a guest on this week’s edition of MMA LIVE. After thoroughly dominating Anderson Silva for 92 percent of their showdown, Sonnen was abruptly submitted by the champion with only 110 ticks remaining on the clock. Immediately following the contest, the part-time realtor stated he was “devastated” by the loss. After spending several months verbally abusing “The Spider,” only to back it up last Saturday in Oaktown, Sonnen was mostly complimentary of Silva as he broke down the dramatic 5Round affair with the ESPN2 crew. While the planet’s deadliest marksman didn’t throw too many strikes, the challenger states the few that landed definitely left marks. 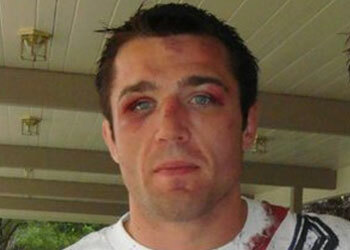 “Anderson never touched me once in the fight that didn’t hurt,” Sonnen admitted of the 185-pound king’s power. Being punished by the man that jabbed former UFC light heavyweight champ Forrest Griffin into unconsciousness wasn’t a complete shocker to the Team Quest fighter, but getting submitted by the Brazilian jiu jitsu “black belt” was the last thing he was expecting. “I never envisioned him winning the fight from the bottom,” Sonnen said of the triangle/armbar submission that ended his evening.